Arinsal is the area accessed from the town with the same name. It is a smaller area, which is perfect for beginners who are going to do lessons since the area is a great valley where all the slopes end up at the same point, at the base of the resort. Therefore, it is very difficult to get lost and it is a place where you will feel protected and safe. If you want to book your lessons in the Arinsal ski school, you can do it here. On the other hand, the Pal area is accessed through La Massana. The gondola leaves the town and arrives at the base of Pal. This area is lower than Arinsal, however, is more protected from the wind, so the maintains a good condition. We love Pal because all its tracks are surrounded by trees and it’s a beautiful area. If you come on holiday to Pal Arinsal, we recommend you explore both sectors. Here we explain how you get from Arinsal to Pal, now you just need to come to Andorra and explore this beautiful Vallnord resort. You can take the blue run Port Vell until you reach the Port Negre chairlift that will take you to the highest point of Arinsal next to Pic Negre with 2.500m. 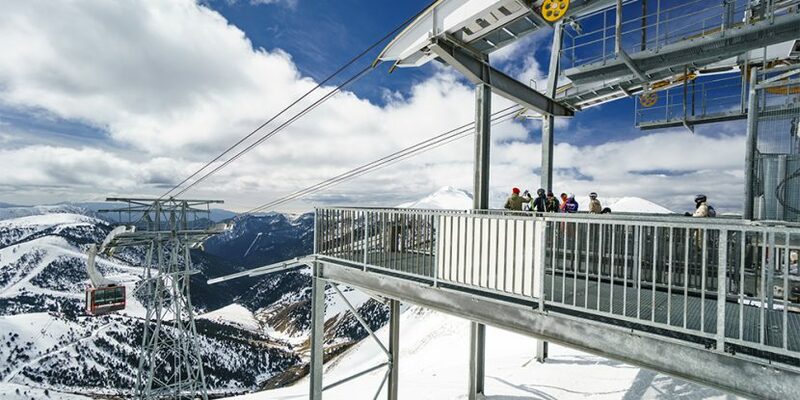 For the most experienced, the fastest option is to take El Coll drag lift also from Port Vell track, it is a fairly steep ski lift so we do not recommend it for those who are not confident on the slopes, however, it is the fastest way to get to the top of Arinsal. Once at the top you will see the path to the great Cable Car that connects the areas of Pal and Arinsal. This large gondola fits up to 50 people and leaves approximately every 15 minutes. Enjoy the trip surrounded by stunning views. Don’t forget that the last cable car of the day is at 16:15 so calculate your time for returning to your area. The Cable Car arrives at the base of Coll de la Botella in Pal, one of our favourite areas because is usually very quiet. Just a few metres from where the cable car ends you will find the Coll de la Botella chairlift, take it and enjoy the views of the entire Pal sector to get familiar with the resort and choose your favourite tracks. For those who are confident on blue runs you can take either Cami Superior or Cami Inferior which are easy blue paths that will take you to the Pla de la Cot area. Here you can find one of our favourite restaurant with a great terrace for sunny days. Here you will see two magic carpets, which you can take to avoid pulling yourself if you are tired. The second magic carpet connects with La Serra track, a very easy and beautiful blue track surrounded by trees. It is a long slope but quite flat ideal for those who are starting to ski. This run will lead you to El Planell, from where you will be able to see the base of Pal. The Planell is a green slope where you will find all first-timers learning to ski. If you keep going straight from the top of Coll de la Botella you will find, on your left, a black track called La Comellada. The beginning of it is quite steep, recommended for experienced skiers but it is true that it is one of the most beautiful runs of the resort, because it ends in a quiet path between the forests. If you do not dare with the black ones yet, you can follow the path from Coll a little more and to the left, you will find a red track called Coms that will take you to the same point, to the Cubil chairlift. This chairlift will take you to the highest peak in Pal, Pico del Cubil with 2,364 meters high, and amazing views, the perfect spot for a photo stop! To the left when arriving in the chair, the red run La Serra Superior will take you directly to the Pla de la Cot area. After passing this restaurant on the left there is a run that we love, El Besurt which is divided into a blue and a red slope, choose the one you like the most depending on how tired you are! Both tracks reach the same point, the base of La Carbonera chairlift that will take you to the top of Planell from where you can see the base of Pal. At the base of Pal you can find restaurants, terraces, ski school, shops, rentals, creperies and much more! Undoubtedly, it is the perfect place to take a break before returning to Arinsal!